I’m in Bath for almost a month now, in Colonna and Small’s. And for these few weeks I’ve tasted a lot of coffees. Probably more different coffees than I’ve tasted all together in my whole life. I’ve written down some of the thoughts I’ve been having about Colonna and Small’s and the way the coffee shop operates. Worth sharing. The menu – this is actually the tool through which communication with the customer is established. Coffee is being served by the origin, not by the name of the drink. The menu has been made with a different purpose compared to most coffee shops – it is communicating the coffee origin, process, variety and flavour notes. There are 6 coffees to choose from – 3 for filter coffee, strictly served black and 3 for espresso. You can imagine that when a new customer comes in, the conversation goes in a very different direction than it normally would in a normal coffee shop. The shop is striking with its simplicity and yet is complicated. Leaving coffee aside, there are only a few soft drinks and a small selection of pastries and sweets being offered. 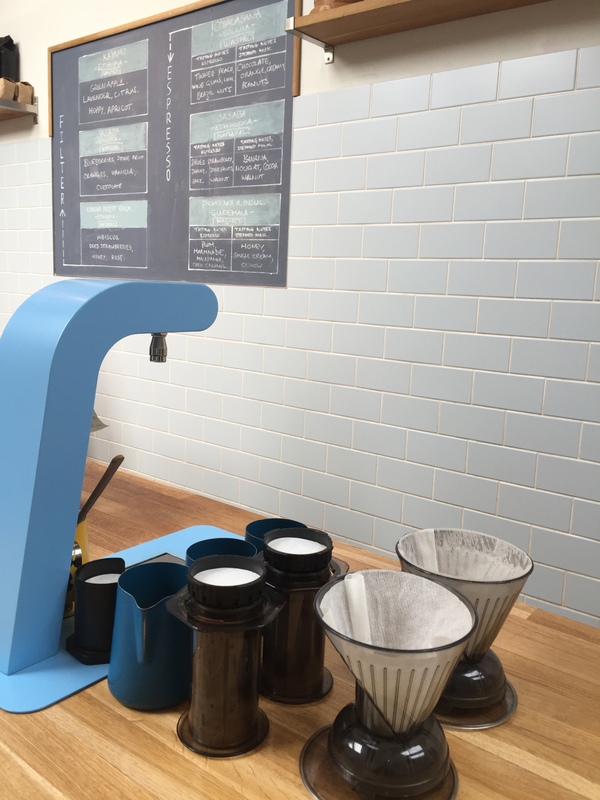 As a multi-roaster coffee shop though there’s a constant engagement with the coffees on offer – tasting, figuring out the recipes and communicating. The environment is very dynamic, there’s a new coffee in every 2-3 days. Working with so many different roasters makes you understand coffee better. It’s easier to differentiate between green coffee and roasted coffee aromas and flavours, and also makes you understand how different roasts behave during extraction. Another thing to acknowledge is the consistency at which coffee is being extracted, not only shot to shot, but from employee to employee. I did not believe everything can be this precise and consistent – the coffee dose is measured before and after grinding, the espresso yield is being weighed, the environment is absolutely controlled and completely comprehended (regarding equipment). Coffee is being used extremely efficient, not a single espresso shot is being wasted, and the extraction yields…I’ve never seen anything like that. The ratio at which espresso is being extracted in the shop is 1:2. There have also been recipes with quite long contact time (40sec). But again everything is very specific to the working environment. Standards are being set and most importantly held. Customers are being guided through their encounter with specialty coffee. Every one of the staff is being trained to host people, but not in the way you would expect in a normal hospitality establishment, customers are not getting it their way. Most of them don’t realise, but the employees are the ones having authority, the popular saying “customer is king” is invalid here. Specialty coffee is not being dumbed down to suit people’s everyday coffee drinking habits. And yet the language used to describe the different coffees (the tasting notes) is not too far off, from the customer. There’s no splitting of acidity, mouthfeel and so on like it is in the Barista Championships, broader adjectives are being used instead (i.e. créme fraiche). And the descriptors are being written on the wall in the order they are being experienced. It’s much like “painting a picture” with tasting notes. For the time I’ve been here in the shop I have seen the refractometer being used only once. In some coffee shops though (i.e. Prufrock in London) sample is being taken from every brew and TDS is being measured before serving. I don’t think that’s bad, if it is done just to check if everything’s alright with the brew. But tasting it and trying to remember how coffee at different extraction rates tastes like – maybe it’s not the best idea. Focusing too much on the number you see there is not helping when it comes to noticing different tasting notes or thinking about what’s the acidity of the brew like. The concept is executed perfectly from the moment you get a glimpse of the unusual for a coffee shop props on the windows (some of Maxwell’s trophies, coffee syphons) till the moment you step out. Absolutely stunning.